I just installed it and will be trying it out during the next few days. I'm super excited! Thank you so much for your effort, @rene ! First, I want to thank you for this brilliant plugin and all the enormous work you've done to develop it! It's incredibly useful and full of wonderful features. However, I also have a question -- or maybe a feature request. Is there any way to use something other than [#] for tags? The problem is, I have a long-established convention where I use [kw] to denote tags. It started years ago, when I tried to make OneNote my research database -- and OneNote utilizes Windows search, which disregards special symbols. So I chose to use constructed words like kwsociety, kwidentity etc. By the time I switched to Sublime Text, it became a habit, and I now have over 200 tags starting with [kw]. Before instlling your plugin, I used Sublime auto-completion list to manage them, and I setup [kw] as a trigger for auto-completion. However, sublime_zk overrides the built-in auto-complete feature, so my tag list stopped working. Also, sublime_zk assumes that tags always start with [#]. Now, one of the easiest solutions is, of course, to use the replace command either to add [#] sign before [kw], or to replace [kw] with [#]. I chose the first option, because it would be easy to revert back if needed. So now all my tags start with [#kw]. However, I've also been using [#] sign to format titles in notes. It was never an issue before, because of my [kw] convention for tags. But now, even after adding [#] sign to tags, I have a problem: when I try to use [#][?] or [#][!] options, I get a lot of extra words, which are not tags. For this reason, I hesitate to install Silver Searcher -- even with persistent search results, I'd still have too much noise. I've been thinking what to do in this situation. Combing through hundreds of notes manually to get rid of the [#] sign in titles is not an option, and I don't know how to automate this process. Hence my question: if it were possible to choose another sign for tags, I could revert to my [kw] convention (or use a [#kw] combination, since I've already renamed my tags). Anyway, any thoughts or advice on this are welcome! I can dig into why the plugin doesn't cooperate with the built-in auto completion. And yes, # is assumed, more on that further down. But what I don't get is you being afraid of the Silver Searcher. In my opinion you wouldn't get more messy output than you do now. You'd just get it much more quickly. I would suggest trying to automate the # cleaning but that probably requires some regexp and sed skills and a lot can go wrong. Think [some local link](#target), just as an example that there's probably many situations where you don't want to get rid of the # even if it's not at the beginning of a line. So I don't recommend it. Making the tag identifier configurable is a sensible idea in general. You are the second one asking for it . Making it so configurable that you can use either kw or #kw will be harder to implement and more difficult to understand by users not comfortable with regular expressions. So my bet would be: get rid of the #kw now, stop doing that, chances are that a single prefix (like kw) will be supported soon. Syntax highlighting will be a problem: Syntax files are not configurable, AFAIK. You can only have a fixed syntax. So when you configure a different tag prefix, the plugin code will cope - but the syntax highlighter will still want #s. You could, of course, hack the syntax file -- but you would need to re-hack after every update of the package. 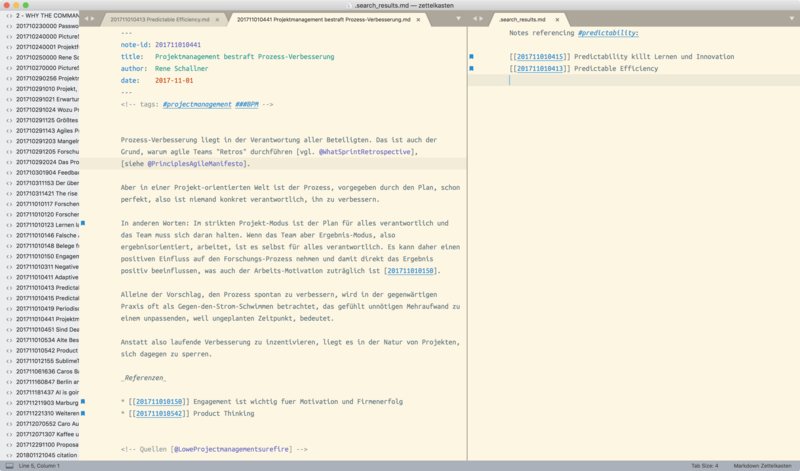 Well, there is an option: I can dynamically highlight tags the same way I highlight (underline) the note links. That's a bit more work but it can be done. He said. I will look into this but I can't promise it will be finished super-quickly. The underlining is necessary because the syntax highlighter cannot be brought to highlight programmatically. But the underlining is set to the tag color, which makes your custom tags stand out almost as well as fully colored tags. Using #? for tag selection, #! 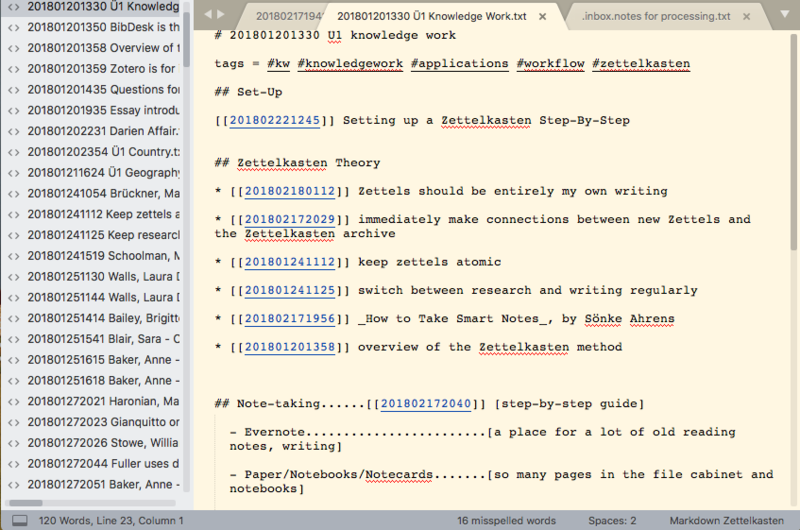 for tag list, [ctrl]+[enter] to search for tag referencing notes, and advanced tag search work with kw, too. @Julia Oh, and BTW I also made the package not suppress completions anymore. You can do this with a regular expression bulk "search & replace" command -- if you get rid of the #kw first, that is. It seems there are some problems with GitHub as I can't install the package on Mac OS X. Package Control: Error downloading repository. HTTP exception InvalidCertificateException (Host api.github.com returned an invalid certificate ([SSL: TLSV1_ALERT_PROTOCOL_VERSION] tlsv1 alert protocol version (_ssl.c:548))) downloading https://api.github.com/repos/renerocksai/sublime_zk. Of course I can install it manually, but I prefer the correct way for easier updates. Hope the issue will be fixed soon. @Vagabondo Thanks a lot for sharing this! Many others are facing the same problem! Cool that you have found a workaround! Downloaded both ST3 and ZK Package to begin my slip box. Completely new to everything. Is there a good step by step on how to install SILVER SEARCHER plugin on a ST3 Windows machine? Apologies for the list of very basic questions that likely will be forthcoming in the future. The README lists 3 sources about installing ag on Windows. Probably the easiest one is to download a release from GitHub. Thanks for the reply! I saw those, but I'm novice enough that I don't understand what I am looking at there. 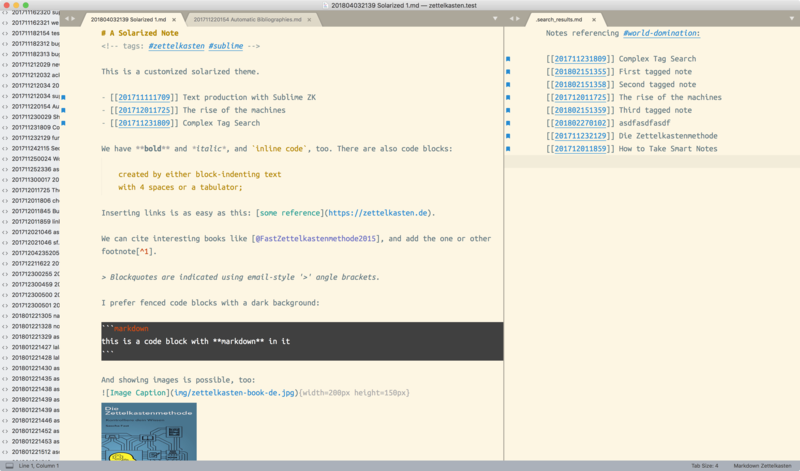 If you want to try it out, update sublime_zk and change your color scheme to Solarized (Light)-ZK. BTW: Huge kudos to @ctietze (and @sfast) for creating The Archive!!! It's really a beautiful piece of software! No, seriously. Maybe the ZK method transforms the brain to prefer "ugly UIs"
As the guy currently trying to implement ZK in org-mode, I have no idea what you're talking about. If any sublime_zk users want a color scheme that attempts to resemble the nvALT scheme (which I am particularly nostalgic for, since it is where all my zettelkasten'ing began ) you might try out the no-frills theme I jury-rigged (that is, reverse engineered) from another similar theme. It is characterized almost exclusively by a tan background and black font, at all levels of encoding. As basic as can be. Simply set your font_face to "Courier" and you're off to the races. NOTE: I am not a programmer, so I cannot vouch for the elegance or stability of this theme. In fact, I can almost certainly guarantee that it is not elegant, and can only say that it has been stable for me. For a perfect C64 experience, download the best C64 True Type Font, unzip it, and install the C64 Pro Mono.ttf by double clicking it. @argonsnorts, you just received an honorable mention in the README ! If it's OK with you, I can add your screen-shot, too? @rene totally cool with me! Ok, @rene , I have a request regarding citekeys -- let's see if it's possible. My question is: would it be possible to incorporate the insertion of the page reference into automatic citekey generation? For example, would it be possible to somehow incorporate the page number into the citekey shortcut, such that typing (for example) "48[#", and then selecting the bibref from the dropdown menu would result in the insertion of [#Ahrens2017] (again, for example)? placing the cursor into the first pair of brackets on insertion. So [x][#citekey] would be inserted, where x is the cursor. I find this more intuitive than the 48[ approach, would that be OK with you, too?